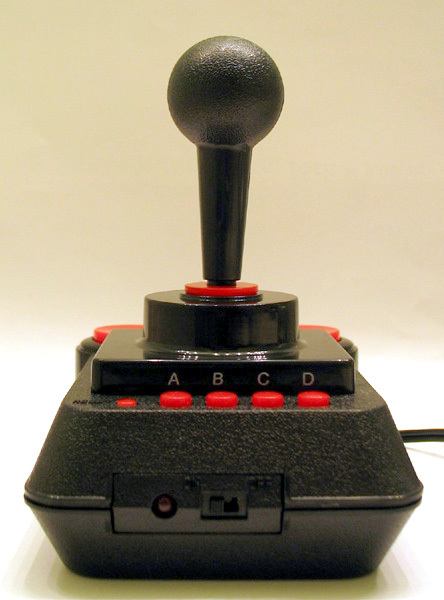 The DTV is a cool joystick, containing a c64 and a lot of games. But wait! There's more! It had been called the most hackable device ever! There are three versions of this device, DTV1, DTV2/3, and Hummer. 6502 emulation with few or no undocumented opcodes. All DTV2/3s are shipped with a minor fault in the video circuit leading to relatively bad colors. This can be fixed. See DTV Mods. 6502 emulation supporting many undocumented opcodes. 6502 skip internal cycle and burst mode selectable. The Hummer was sold at radio shack, with only one game, Hummer Off-Road Racing Challenge game, which was written specifically for the Hummer hardware. Not sold as a commodore device at all. Video output with programmabe color carrier and PAL/NTSC timing. Steering wheel connected to an ADC (equivalent to a Sonix SNAD01C) START, CLK, DIO are hooked up to USR2-0. You COULD just play the games inside the DTV.. but how fun is that? Do the decathlon - wiggle the joystick back and forth (left to right) really fast before the blue screen appears until typing starts. 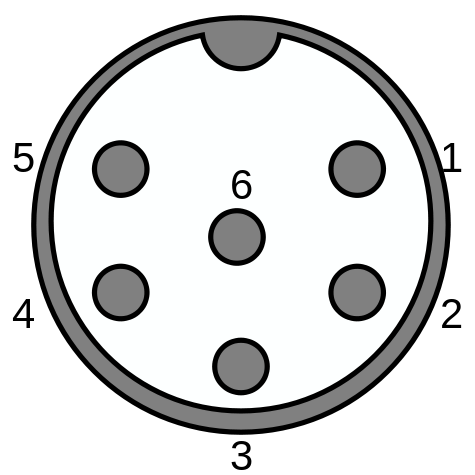 The LOAD"*",8 will not appear, but a LOAD"$",8 will appear. Here you have a few extra programs. If you like to code, then move to the "BASIC PROMPT" program using the joystick, and select the program with the firebutton. When that program is loaded, you now have a virtual keyboard. Just hold fire and it will appear. Quite a few programs will appear on your screen. Holding down the Left Joystick Button to bring up the Joystick Keyboard as the list scrolls will temporarily halt the scrolling, with the problem of the virtual keyboard appearing, blocking about half of the screen. If you have a ps/2-keyboard connected you can press the tab-key, for the same effect as a press of the CTRLkey on a c64, a slower listing. The Entropy Demo is only present in the DTV1. The Entropy demo will load and run. To reach more screens in the demo - Hold down the A Button and move the Joystick up. Hold for a few of seconds and release. The next screen will load and run in a few seconds. There is a total of 5 different screens. Please note that 4 batteries in the DTV gives +6v, and im pretty sure that the keyboard dont like that. However, the DTV works fine on 5v, so just give it some external power. 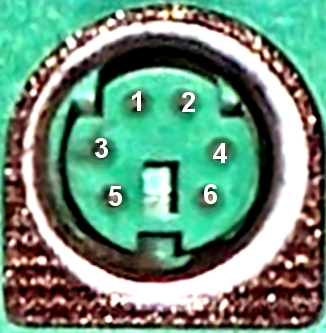 All three connectors viewed from the front. 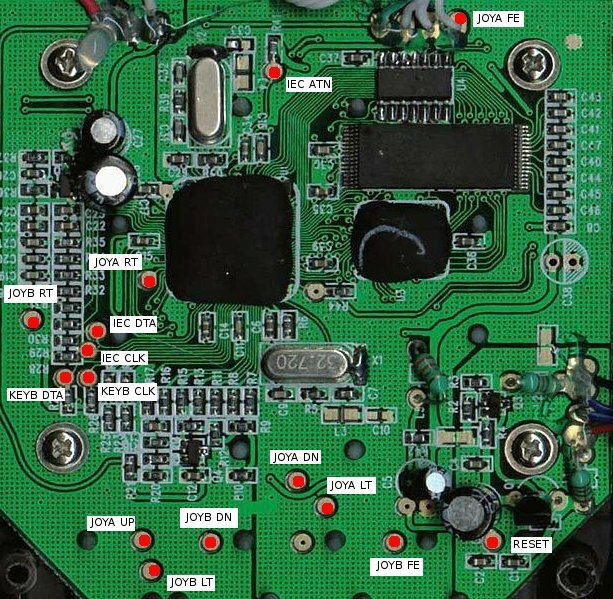 Please note that Joystick Port 1 UP is missing on the PCB.